This photo shows a Sumac tree ( Rhus succedanea) with a little sprout coming out its side. If I had known it was Sumac I probably would have steered clear of the thing. 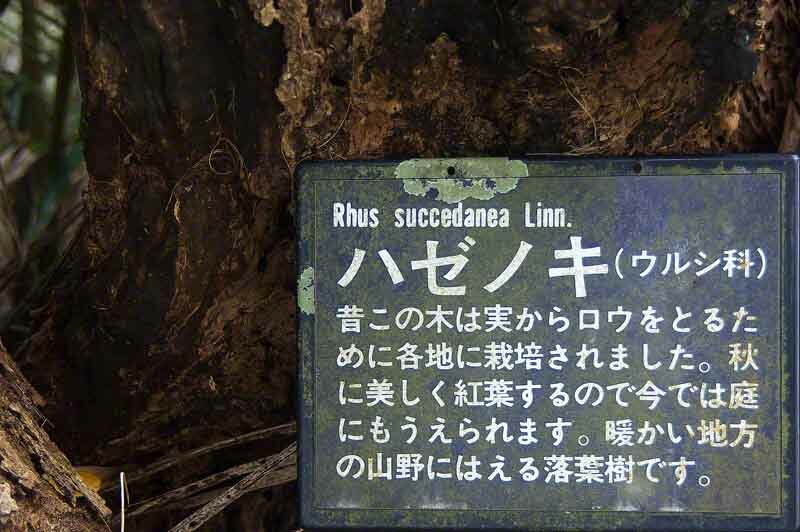 This tree was found while cave exploring in Ginoza Okinawa, Japan. Whenever I find a sign posted on something like this and it has the scientific name, I take a photo to help me identify it later. So, I rearranged some of the vegetation growing around the place just to show you this little fella sprouting out with the bark of the tree as a backdrop. As soon as I Googled the Latin words it brought back bad memories. Sumac, AHHHHHHHHhhhhhh, that stuff is poison where I came from in the USA. There are 250 kinds of Sumac. It turns out this one, native to China and Japan, is a friendly one. 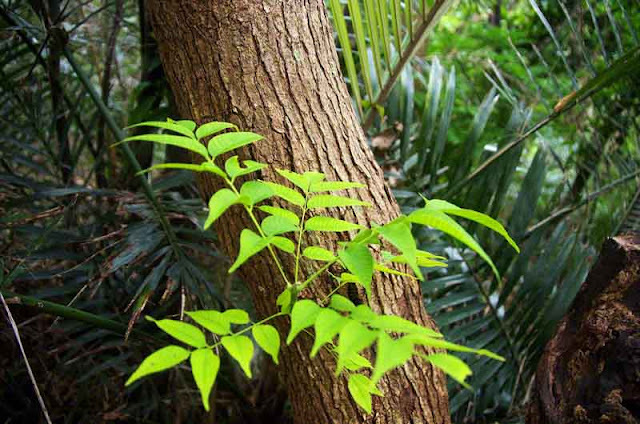 The ones I used to run into were called Poison Ivy, Poison Oak and Poison Sumac. They'd make you want to scratch all the skin off your body. I never want to try that again. WIKIPEDIA and say "Hi" to Jimmy Wales. HE NEEDS MONEY, AGAIN ! It seems like I sent the guy twenty-five bucks last year about this time. I like the guy alright but, who does he think I am SANTA CLAUS OR SOMETHIN' ? Yep poison ivy is one plant you really need to stay away from, I nearly scratched my sack off one year!!! Who the hell is this Jimmy guy that gets sent free money? Is he hiring? Dude, Jimmy Wales is like the founder of Wikipedia. Not to be confused with that Wiki-leaker guy. Last year, I think, I generated about 8 krazillion dollars for him. I ain't sure where it all went but, they got lots of people who need money all over the world these days. So, maybe he's helping them out with our donations. Of course, Mike ...You are generous to a fault...I think you still have my address, right..? As long as you aren't that Betty Crocker gal; I have it !